Pandora, the popular music streaming service added Chromecast support to its Android and iOS apps to control streaming through a television. 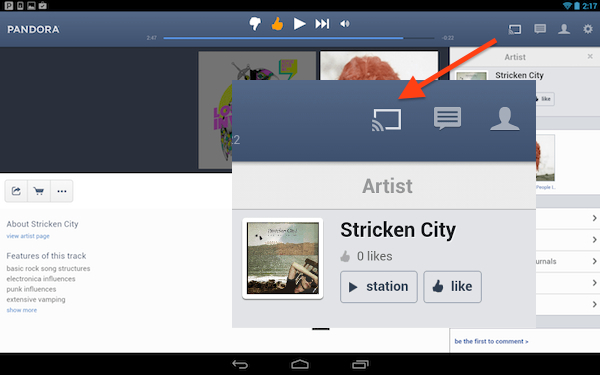 Yesterday, when Pandora updated its android app to provide enhanced support for tablets, the screenshots accidentally showed the Chromecast button and later removed it after a Google Play commenter pointed it out. It seems that the company was ready to start Chromecast streaming yesterday but wasn’t able to launch and pulled out, may be because of iOS store approval to finalize the service, not confirmed, just a guess. However, if you already downloaded the latest version of Pandora app on iPhone or Android devices, then you will be able to see a Chromecast option after turning on your TV with Chromecast which connected to the same WiFi network with your device – a simple one touch streaming- isn’t it cool? Company’s tv.pandora.com system will handle the streaming via Chromecast along with the current gaming console streaming such as in Sony PlayStation and Microsoft Xbox to enjoy the Pandora music streaming on big screens with big sounds. The Chromecast is supported in Android phones and tablets as well as iPhones, but currently it won’t support Apple iPads and the company said it as coming soon. What is your view on this? Have a say in the comments below. If you haven’t tried Pandora yet on your smartphones – download it from here for Android and here for iPhones.